President Donald Trump gestures as he finishes his first State of the Union address in the House chamber of the U.S. Capitol to a joint session of Congress Tuesday in Washington, as Vice President Mike Pence and House Speaker Paul Ryan applaud. 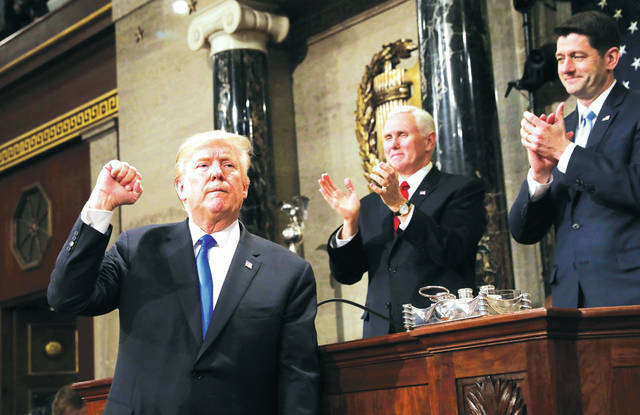 WASHINGTON — In vivid detail, President Donald Trump told stories of American heroism, heartbreak and tragedy in his emotionally charged first State of the Union. What he didn’t detail were solutions to the crises ahead. Trump’s 80-minute speech surveyed familiar territory for a president drawn to drama. He warned of gangs, nuclear threats, the drug epidemic and unlawful immigrants. He highlighted guests in the crowd, a group representing a mix of valor and victimhood, which he used to illustrate his calls for patriotism and perseverance. But his vision for a way out of what he once described as “American carnage” was not nearly as clear. Although he said lowering prescription drug prices would be “one of my greatest priorities,” he did not suggest a strategy for getting it done. He hinted at hopes for reforming prisons, supporting family leave and improving job training, with little meat on the bone. He raised hopes for an infrastructure plan but provided little guidance as to how the plan should be funded. Trump’s most detailed proposal was, perhaps, the most contentious. When Trump outlined his four-part immigration plan Tuesday, a grim-faced House Minority Leader Nancy Pelosi held up her hands to try to silence the booing Democrats. Republicans, too, have deep reservations about his hopes for cutting legal immigration. The debate has left the fate of hundreds of thousands “Dreamer” immigrants uncertain, as they wait for a Trump-imposed expiration date for the program that protects them from deportation. Trump did not acknowledge that hurdle Tuesday, or the government shutdown looming if Democrats hold to their demands that a Dreamer deal must be tied to a budget plan. He did advocate for compromise — an unusual role for the often strident president. Democrats are likely to remain deeply skeptical about Trump’s ability to play the role of bipartisan broker. He has often shifted positions without notice and, at times, seemed unfamiliar with details. Freshman Rep. Raja Krishnamoorthi, D-Ill., said he was happy to hear Trump bring up infrastructure, controlling prescription drug prices and boosting vocational education but said he was short on detail. “It sounds like, ‘I’m for world peace.’ Fine, how do you get there?” Krishnamoorthi said. Republican Sen. David Perdue of Georgia, who has been working closely with the White House, said he believes Trump offered guidance on finding a solution to the impasse on immigration. Trump did not address his outsized role in fostering the party rancor. Ever the salesman, Trump spent much of his speech highlighting the accomplishments of the last 12 months while taking credit for the nation’s roaring economy and booming stock market. Suppressing his penchant for making the moment about himself, Trump repeatedly highlighted the guests sitting in the Capitol, each of whom possessed a powerful story. There was a North Korean defector who defiantly waved the crutches he used to make his escape after losing a leg. There were the New Mexico police officers who adopted the baby of a heroin addict. And the tearful black family who lost their child at the hands of an immigrant who had entered the United States illegally.